A crossing of the world’s largest salt flat, from La Paz in Bolivia to San Pedro de Atacama in Chile, rates as one of most impressive adventures you can possibly have in South America. 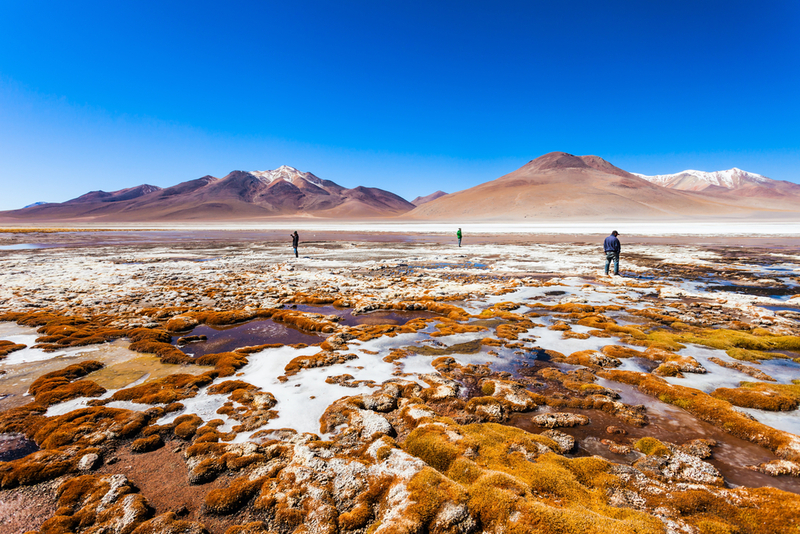 In one of the most remote regions of the continent, you’ll discover astonishing landscapes of seemingly endless salt plains, sporadically interrupted by otherworldly islands. If you’re looking for Latin America’ ultimate desert dream adventure, you really can’t look past a La Paz to San Pedro de Atacama crossing. La Paz to San Pedro de Atacama – What can you expect? Despite the crossing being one of the most coveted adventure tours in South America, the infrastructure here is still quite basic. There is a range of hotels, including luxury hotels with Spa facilities. You won’t find asphalted roads out here. What you will find is an abundance of ethereal landscapes is stretching out into the horizon from every direction. You’ll find blissful peace, a feast for all your senses, and arguably one of the best stargazing experiences in the world. Tours across Salar de Uyuni and the Atacama Desert run between La Paz, Bolivia’s capital, and San Pedro de Atacama, one of the most delightful outback desert towns you’ll ever see. Of course, tours can run in either direction, but the popularity of tours starting in La Paz actually hint at this being the best option. Why? Because after spending a few days completely disconnected from the rest of the world crossing the salt flats, you’ll want to emerge in a quiet and soothing place like San Pedro. 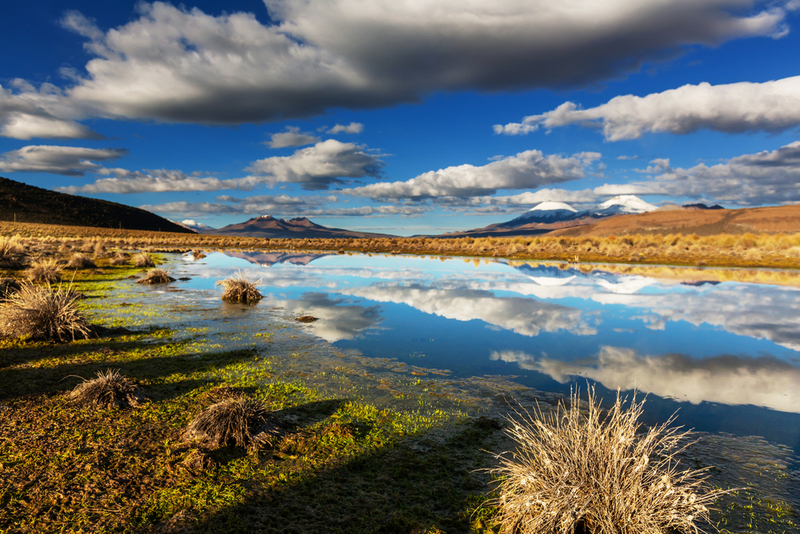 Because after a day’s rest, you can go off again, this time exploring the wondrous Atacama Desert. This way, the therapeutic effects of a remote adventure linger longer. La Paz, on the other hand, is a vibrant city, brimming with a thousand distractions, hectic traffic and bustling markets. Absolutely fantastic to start, but it can also be a sensory overload. After doing trips in both directions, I would definitely recommend starting in exciting La Paz and ending in leisurely San Pedro de Atacama. This way, you’ll get the best of both worlds without feeling like you need a Valium! 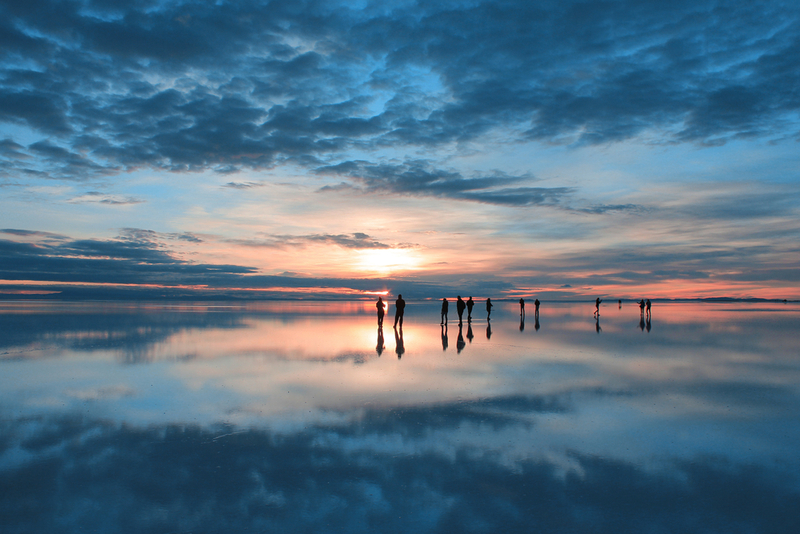 You’ve no doubt seen incredible photos of Salar Uyuni already. Whether crossed in dry or wet season, sunrise or sunset, you’ll no doubt agree that this is one of the most beautiful places on earth. Technically speaking, a crossing of the Salt Flats start from the small and unassuming town of Uyuni, a short plane ride (or 8 hour drive) from La Paz. Right on the edge of the homonymous Salar, Uyuni is framed by an arid landscape of over-salted land. There isn’t much that grows here, contributing to the ‘dusty outback town’ feel of the place. Yet behind the somewhat unimpressive façade, Uyuni is actually quite the charmer. Aside the BEST pizza joint in all of South America (wait until you go and have the ‘911 super supreme’ before arguing!) 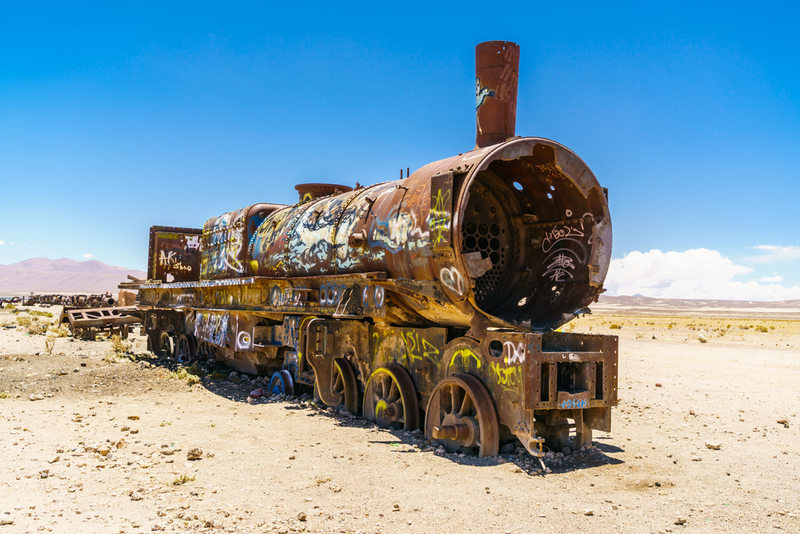 Uyuni is also home to the surprisingly mesmerizing train cemetery, where you’ll find a collection of abandoned tracks and wagons that make for some pretty wicked photography. 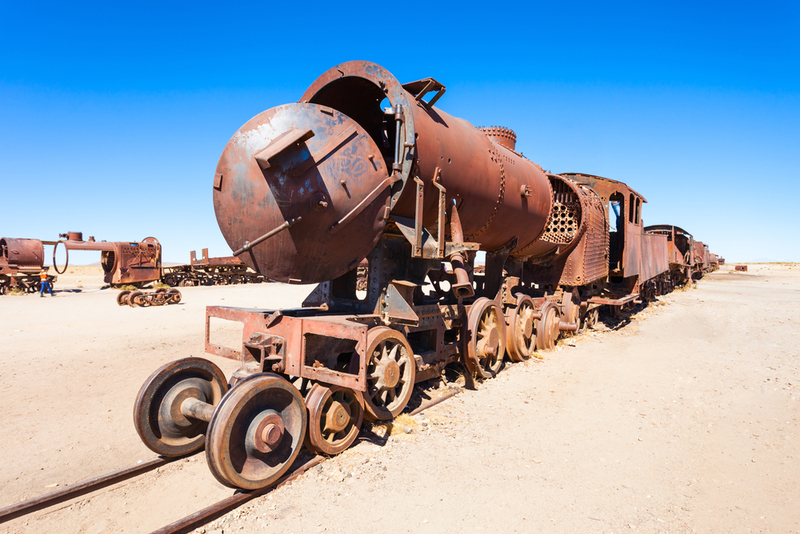 During colonial times, trains used to transport minerals from the Bolivian Altiplano all the way to the Pacific Coast, from where the cargo would be shipped abroad. Here, you’ll find all that is left. 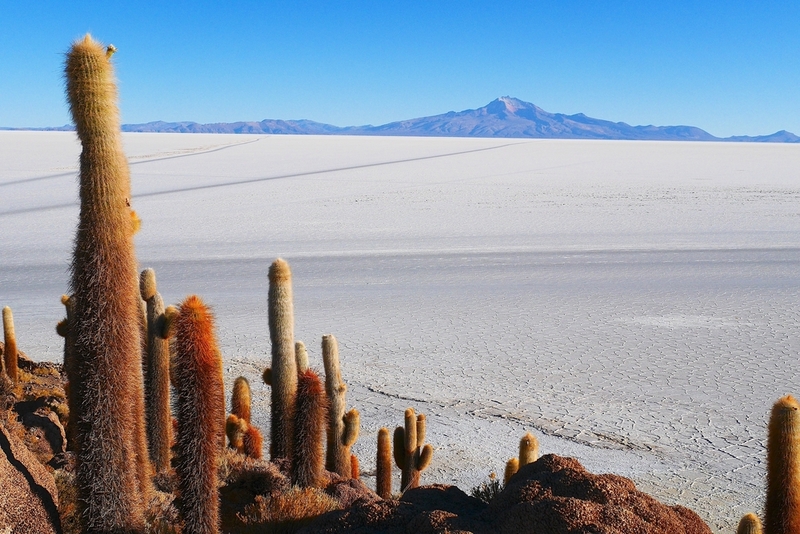 Sitting at almost 3,700 metres in altitude, Uyuni is a good base to stock up on supplies for your upcoming adventure. So while your guide is busy getting that sorted, you’ll be free to wander through the central markets, photograph ghost trains and, naturally, gorge on that pizza! The crossing of the breathtaking Bolivian Altiplano and Salt Flats makes for a couple of unforgettable days. The piercing light of the sun reflecting on the salt, the bizarre islands which seem to jut out of nowhere. The extensive starry skies at night, the fuming geysers and coloured lagoons. The sheer variety of sights is mind-boggling. If you get the distinct impression that this is the most beautiful place in the entire continent…you certainly won’t find me objecting. 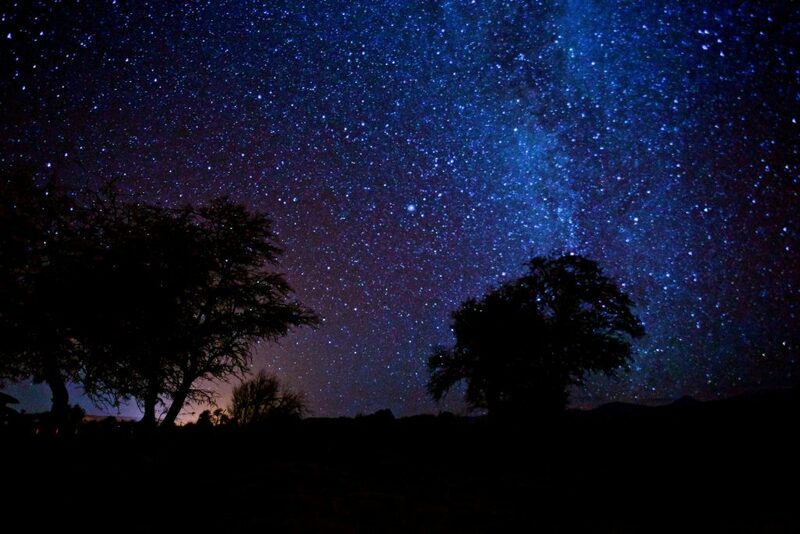 If you’re at all impressed with the night skies on the Salt Flats, just wait until you get to San Pedro de Atacama. 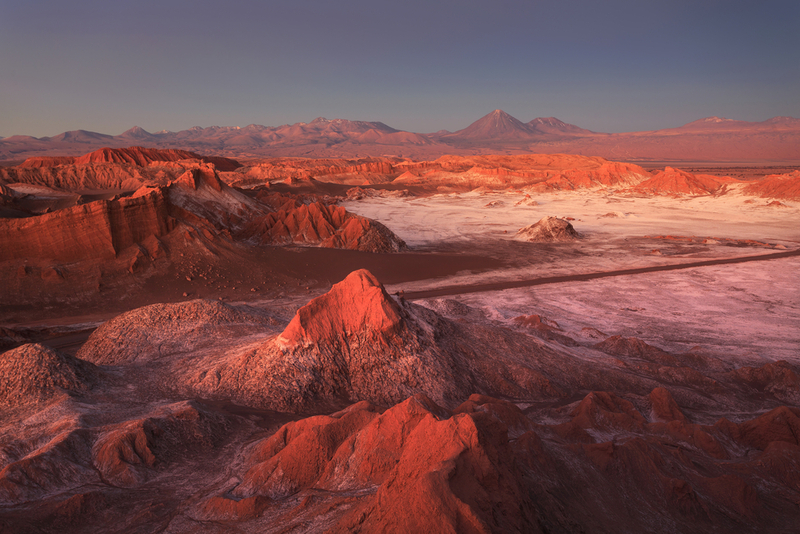 Just over the border into Chile is where the spellbinding Atacama Desert begins. This is one of the world’s best stargazing sites, home to international high-tech observatories. The desert stretches for a little over 1,000 km and is cradled by the high Andes on the east and the cold Pacific Ocean on the west. It is narrow, dry as a bone and enjoys very little light pollution. This is what makes the air crisp and the skies so incredibly bright, clean, and piercingly clear. Everything in the Atacama is just that little bit more spectacular. The sunsets are some of the most splendid you’ll ever witness. 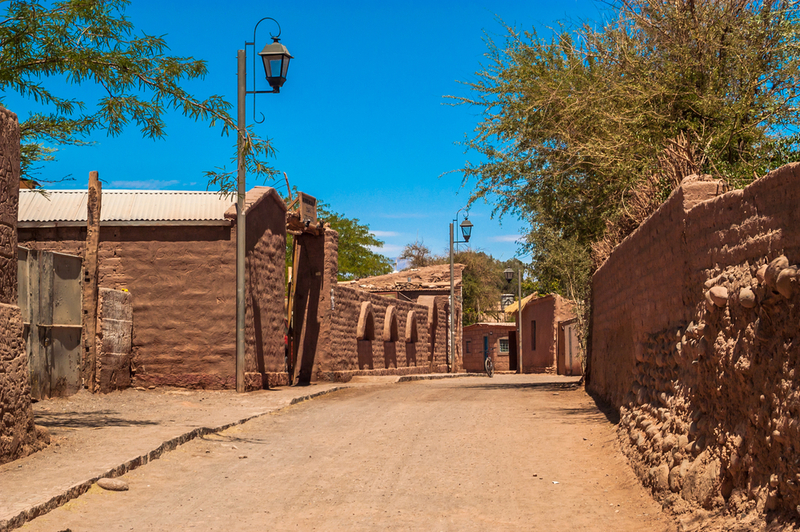 Plan to spend a few days in San Pedro de Atacama, a sandy desert town where life is calm and time seems to almost stand still. Great food, excellent bars and plenty of activities – like horse riding and desert hiking, will certainly keep you busy if you’re suddenly overcome by the desperate desire to actually do something. If not, simply sit back, enjoy the comforts and just sink yourself into one of the most atmospheric outposts in all of South America. 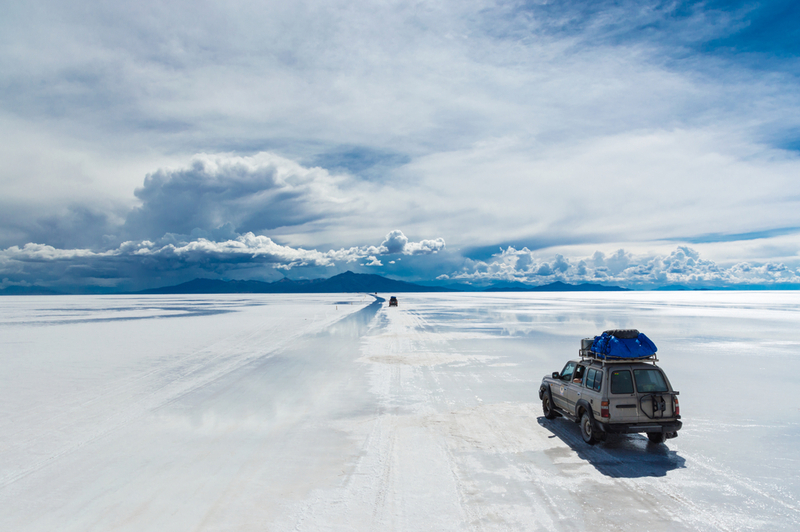 Drive across world’s largest salt lake, the Salar de Uyuni, one of South America’s greatest experiences to San Pedro de Atacama, an oasis in the world’s driest desert. Chimu Adventures can give you the most awe-inspiring experience. Are you interested in other South America experiences? Click here so discover our array of tours.